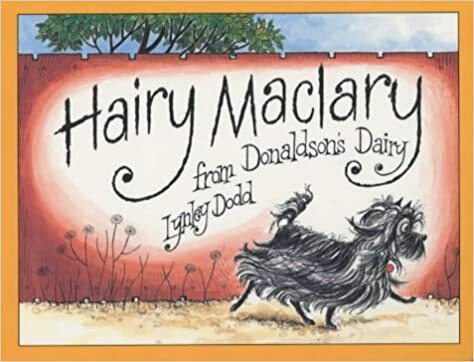 Activity 1 : One of the most famous children's story to ever come out was Hairy Maclary From Donaldson's Dairy by Lynley Dodd . The book was originally published in 1983 . It's now sold in many countries . It features a small dog called Hairy .Dog term for Harry I guess. I don't know whether I'm supposed to remake it but here it goes. Out of the gate and off for a walk went Hairy Maclary from Donaldson's dairy , A normal walk but then came Muffin Mclay . Looking like a bundle of hay , He saw another dog he was probably gonna say hey . That dog was Bottomley potts covered in more than 100 spots. (maybe not I'm just making this up). Then came schnitzel Von Krumm with a low as tum. Then came Hercules morse lookin' as big as a horse. Walking on the street , tails up . They were scared when Scarface claw showed up . With a yowl and a howl , a clashin' of claws and paws , The dogs ran , but Scarface probably caught up with them . Cause he say's he can. But they didn't care , cause they just ran. You've worked so very hard to complete all of these activities in a very short time - good effort! But sometimes you've misunderstood the task. In this activity, for instance, you were asked to add your own lines to the story - to make up your own version of what might happen to Hairy Maclary, as if this were your story book. You've done that to a small degree, but it does rather look like you didn't quite understand what was being asked of you. Thank you for taking a go at it anyway! I hope you really enjoyed your time in Samoa! I'm Rachel's mom from Canada, participating in the blogging program too.